The value-adding capability of Australian manufacturer ReCoila has been a key element of its successful expansion into the growing Asian energy market, in this case to Malaysian powerhouse, Petronas. Specifically, ReCoila's ability to refine engineering and build to high specifications landed it a contract to design and manufacture a twin-reeling station to manage hoses for diesel refuelling responsibilities and potable water distribution on offshore platforms in the Malacca Straits. For ReCoila Managing Director Mr Michael Pawson, it potentially opens a doorway to more work in a region which traditionally doesn't use Australian manufacturing but in this case saw the company's high capabilities as key aspects of its investment. "Petronas is a huge company which went to various parts of the world to source this solution, but one of the key reasons we won the work is our proven track record in designing and manufacturing customised solutions that require a high degree of accuracy and heavy duty tolerance and reliability," said Mr Pawson. "It yet again proves that we are now generating more awareness in export markets and we will definitely look to expand on our association with Petronas in this part of the world." "Petronas reached out to us when they heard about our capabilities in these complex, large-scale projects." Part of the Petronas sphere of activity is in oil and gas mining from offshore platforms in the Malacca Straits which line the coast of its home country, Malaysia. Its use for ReCoila's custom product came about largely through the need to update processes and equipment. The platforms feature twin function points which act as refuelling stations for diesel operated equipment, as well as distribution points of potable water for drinking should drinking water run short in supply. Traditionally, because offshore platforms in this region are closer to sea level due to the lower swell height compared to that of their North Sea counterparts , reels are not traditionally used to lower hoses to transfer the diesel and/or water; these were merely lowered by cranes directly from platform. 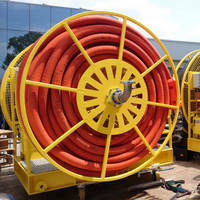 The hoses however present a very real safety hazard, weighing more than 500kg and being cumbersome and awkward to manhandle. With the realisation of this safety risk and the premature failure of hose due to the continued end load twisting a solution was sort through the custom design and engineering of hose reels to perform this task, safely as well as provide extended hose life. Because these platforms have been in use for a considerable length of time, they were never designed for reels; so part of our challenged was to offer a solution that would also retrofit within an existing platform's design and footprint for a seamless integration when on site. Considering each of the twin reels are over two and a half metres in diameter, the challenge for precise measurement, design and construction was critical. When installed and commissioned, one side of each twin reeling station will provide potable drinking water while the other will transfer diesel for refuelling generators, cranes, handling equipment and other fuel powered equipment.